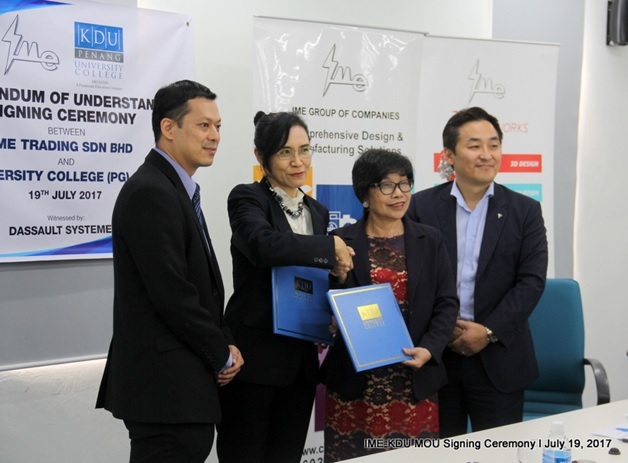 George Town, 19 July – KDU Penang University College (KDU Penang) signed a Memorandum of Understanding with IME Trading Sdn Bhd (IME), a member of IME Group of Companies, at its campus today. The collaboration is made to explore opportunities that would develop, support, and enrich the curriculum for the KDU Penang Engineering students. This involves seminars, workshops, as well as other training activities. As part of the agreement, KDU Penang students will be able to access SOLIDWORKS software tools that they need for engineering design, simulation, sustainable design, and documentation, even when they are not in the classroom. International Certification exam vouchers which includes Certified SOLIDWORKS Associate (CSWA) or Certified Sustainable Design Associate (CSDA) or Certified SOLIDWORKS Simulation Associate-FEA (CSWSA-FEA) or any combination thereof will also be made available. Through the collaboration, IME will also assist KDU Penang to set up their SOLIDWORKS Certification Center. Being the first education institution in Malaysia recognised as an accredited SOLIDWORKS Academic Certification Provider, KDU students could gain professional experience in the field of Engineering and build their project design portfolios with the international professional certification prior to entering the job market. KDU Penang will also implement SOLIDWORKS Campus Teaching Licenses package Student Refresher training for CSWA or CSDA or CSWSA-FEA examination. Currently, SOLIDWORKS has the highest market share of the overall Computer-Aided Design market. More than 70% of the higher learning institutions in Malaysia (100 over institutions) are supported by IME and producing graduates with SOLIDWORKS competency. To date, there are more than 250,000 certified SOLIDWORKS users worldwide. “We have always been passionate about nurturing and supporting the youth. We believe that the future lies in their hands. By equipping them with the right tools and exposing them to latest technology, we believe that we can inspire younger generation to think differently. We want to empower them to be the future leader,” said Madam Julia Wee, the CEO of IME Group of Companies. The Memorandum of Understanding was signed by Madam Julia Wee, the CEO of IME Group of Companies and Dr Chong Beng Keok, the Vice Chancellor of KDU Penang. The signing was witnessed by Dr Yeap Gik Hong, Head of School of KDU University College (PG) Sdn Bhd and Mr. Brian Sung, the Vice President of Professional Channel, Asia Pacific South, Dassault Systèmes.